Coastal oceans are commonly defined as the areas from the shoreline to the outer edge of the continental margin. They connect the continents to the open ocean and serve as a link for transporting organic and inorganic, natural and anthropogenic material from land to sea. They are the most biologically productive part of the ocean, the most fished, and the most subject to anthropogenic modifications and extreme events. About half of the world population lives within 200 km from a coastline and this percentage is projected to grow. The increase of the human coastal zone population brings a greater demand for food, marine resources and recreational and commercial uses of the shore. The coastal ocean also encompasses the Exclusive Economic Zone (ECZ) defined by the United Nation Law of the Sea Treaty as a 200 nautical miles wide ocean area controlled by a given country facing that water, with political and practical consequences for research, resource exploitation and conversation. The Coastal Ocean Systems theme engages in the multidisciplinary science required to understand and resolve the complexities of the phenomena impacting the coastal zone and to manage coastal problems. Projects focus on a broad range of topics, from oil spills, beach erosion, tsunamis and storm surges to eutrophication due to agricultural fertilizers, impacts of land-use changes and climate change. Coastal Ocean Systems are under a growing number of climate and human pressures that alter the sustainability of environmental services and the value of the natural capital, including food production and energy extraction, which ultimately affect society. The Earth system has multi-scale interactions and impacts that include the physical (e.g. sea level rise, ocean waves, erosion), biological (e.g. eutrophication, food web dynamics, fish distribution, phenology), chemical (e.g. ocean acidification, coastal hypoxia and dead zones, harmful algal blooms), and human (e.g. fishing, development and maintenance of coastal structures, ship operations, ecosystem resource management, gas & oil extraction) dimensions of coastal systems. Understanding, monitoring and predicting the interactions between Earth processes and the different dimensions of coastal ocean systems is a challenge central to several major research initiatives of the OSE program. 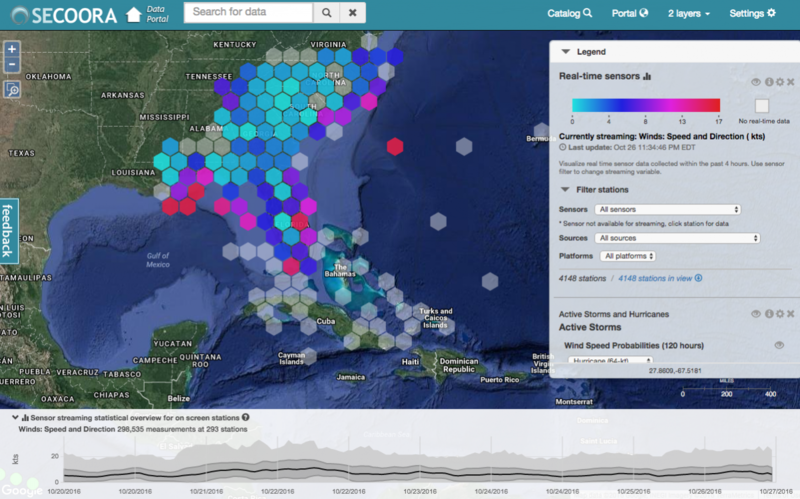 An example of live data streams from the Southeast Coastal Ocean Observing Regional Association (SECOORA), one of several coastal ocean observing networks around the entire United States (see https://ioos.noaa.gov). OSE is involved in a new data science initiative in Multi-Scale Coastal Systems Dynamics & Informatics in collaboration with the Georgia Tech Institute for Data Science and Engineering (http://ideas.gatech.edu). The goal is to combine large data streams, from both coastal ocean observing networks (e.g. SECCORA) and coastal ocean models, with approaches from statistics, machine learning and data mining to diagnose robust Earth processes, and detect anomalies across the physical, biological, chemical and human dimensions of Coastal Ocean Systems. Many densely populated coastal areas around the world are low lying and susceptible to relative sea level rise (SLR) associated with climate change, land level subsidence or tectonic subsidence. Coastal defense structures have been constructed as barriers to certain storm surge, storm wave or tsunami heights. Typically even without SLR the design criteria change over time as hazards get reanalyzed or remodeled. The decrease in risk reduction due to relative SLR and the performance of existing defense barriers under loading conditions beyond the design need to be determined. Potential upgrades or adaption of existing coastal defense barriers subject to SLR need to be proposed and evaluated. Georgia Tech has partnered with 15 research institutions in the ECOGIG consortium lead by University of Georgia. ECOGIG brings together physical oceanographers, marine biologists, and biogeochemists in an effort to understand the fate and impacts of oil and gas on deepwater ecosystems in the Gulf of Mexico, and to chart the long-term effects and mechanisms of ecosystem recovery. CO2 emission will continue increasing, as fossil fuels will most likely remain the major source of energy in next few decades. The oceans uptake atmospheric carbon, partially compensating the CO2 increase, but in turn they become more acidic. The rate of ocean acidification (OA) today is faster than at any time in the past 300 million years. Pumping CO2 into the deep ocean has also been proposed as a viable way to decrease emissions (carbon sequestration). Several groups at Georgia Tech explore the dynamics and impact of ocean acidification through modeling, laboratory and field experiments. Along with fast growing levels of CO2 in the atmosphere and ocean, increasing loads of nutrients like nitrogen and phosphate in coastal areas are leading to higher rates of new production of organic material (e.g. algal blooms). When this material is decomposed, oxygen in the water column is utilized and in some cases depleted below critical levels for the healthy survival of marine organisms (hypoxia). These hypoxic conditions can some time be extreme and lead to complete anoxia, causing the formation of the so-called coastal dead zones. It is estimated that about 10% of the world ocean has low oxygen levels in the so called oxygen minimum zones (OMZ). Scientists at Georgia Tech use earth system models to understand the dynamics controlling the changes in oceanic OMZ. These models simulate the interaction between the ocean, atmosphere, land and the cryosphere. Creating sustainable and resilient cities requires understanding the network properties of food, energy, water and other infrastructure. At Georgia Tech several groups are working towards new methodologies to understand and quantify the resilience and sustainability of coastal areas such as the location-independent scalable framework for Community based Sustainable Coastal Area Resilience Planning (C-SCARP), and the Ecological Network Analysis (ENA) tool. These methods help managers to take into account the environmental, ecological and social dimensions of coastal systems in their development plannings.